According to Wikipedia, superfood is a marketing term used to describe foods with health benefits. For example, spinach and kale are known as superfoods because they are enriched with iron, vitamins, antioxidants and many beneficial nutrients. However, the superfood term is not casually used by dietitians and nutrition scientists as some believe that it is just a marketing term to promote health supplements. Yes. I'm a believer of superfoods but not the over-the-top kind! Well... meaning that everything that I eat doesn't have to be superfoods! Like I always say, I'm the sort of person who like to stay energized and active by eating a balanced proportion of good food. Food that is fresh, least processed and must taste good!!! When I first saw this superfood salad recipe from the book, The Dinner Ladies by Sophie Gilliatt and Katherine Westwood, I really love it! To me, it is such a clever way of bringing out the beauty of many superfoods like quinoa, spinach, edamame and sweet potatoes and transform them all into one real good food... so good that I would say just this vegetarian salad itself can be a fulfilling summer lunch or dinner. I really like this salad. Do you? What are the superfoods in this salad? One of superfoods that I have added in this salad. 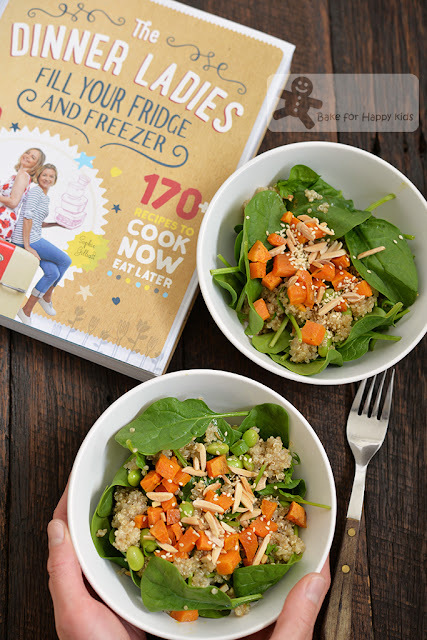 Want to make this superfoods salad for you and your family? It's easy... Watch my one-minute video to see how I made my salad. Note: For vegans, you can replace honey with malt syrup or agave syrup. Extra: 1/2 large handful mint, leaves only, coarsely chopped if you like, mentioned in the book but I didn't add this. combine all dressing ingredients. Taste and add more soy sauce or honey if required. Set aside. Place sweet potato, olive oil, salt and sumac in a baking tray and toss until the sweet potatoes are well coated with the other ingredients. Bake for 30 mins, or until golden brown and tender. Set aside to cool. While the sweet potato is roasting, rinse quinoa well in a sieve and measure the rinsed quinoa in a measuring cup (mine is 3/4 cup). Calculate 1.5 x the volume of the rinsed quinoa and add the calculated volume of water (mine is 1 1/2 cup) into a saucepan. Place saucepan over high heat and bring the water to the boil. Add the rinsed quinoa, cover the saucepan with a tight-fitting lid and reduce heat to low to simmer for 12 mins. Turn the heat off and with the lid on, let mixture to rest and stand for another 10 mins. If the water hasn't been completely absorbed, rest for another 5 mins. Remove the cover from the saucepan and use a fork to fluff and loosen the cooked quinoa. 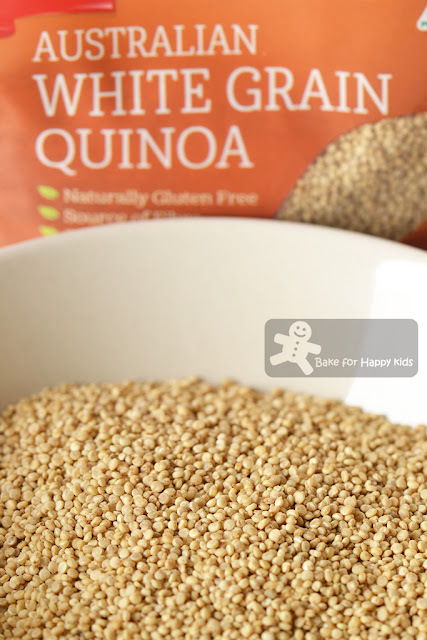 Transfer it into a bowl and cover it with a plastic wrap and refrigerate it immediately to stop quinoa to cook further on its own. This refrigeration step is important because quinoa will lose its subtle crunch if it is over-cooked. In another saucepan, add adequate amount of water plus a pinch of salt to cook in high heat until the water boils. Add edamame and cook for only 30 secs. Drain under cold running water to cool, then release the beans by squeezing the pods into a bowl. Mix quinoa with spring onions, parsley, mint (optional) and edamame. Arrange the baby spinach leaves in a bowl and drizzle about 1 tsp dressing on it. Toss the quinoa with the rest of the dressing and arrange the quinoa mixture on top of the spinach. Top the salad with the roasted sweet potato. Sprinkle the toasted almond and sesame seeds on the salad. Serve. 1. The dressing can be made up for 1 week ahead and kept in an airtight container in the fridge. 2. 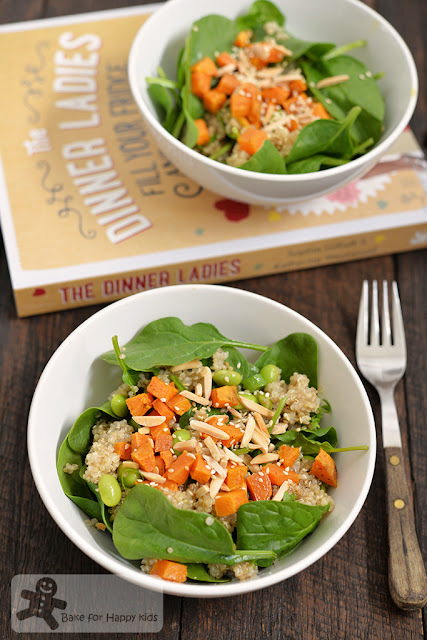 The roasted sweet potatoes, quinoa and edamame can be made up to 3 days ahead. The quinoa can be cooked, cooled and mixed with the herbs, edamame and spring onions and kept in an airtight container in the fridge, with the sweet potato in a separate container. The nuts and seeds can be toasted, cooled and kept in a small airtight jar up to l week ahead. To serve, bring the refrigerated sweet potato to room temperature before assembly and consumption and assemble accordingly. I love love love this SUPER awesome Superfoods salad!!! Do you? I love love love this book too!!! 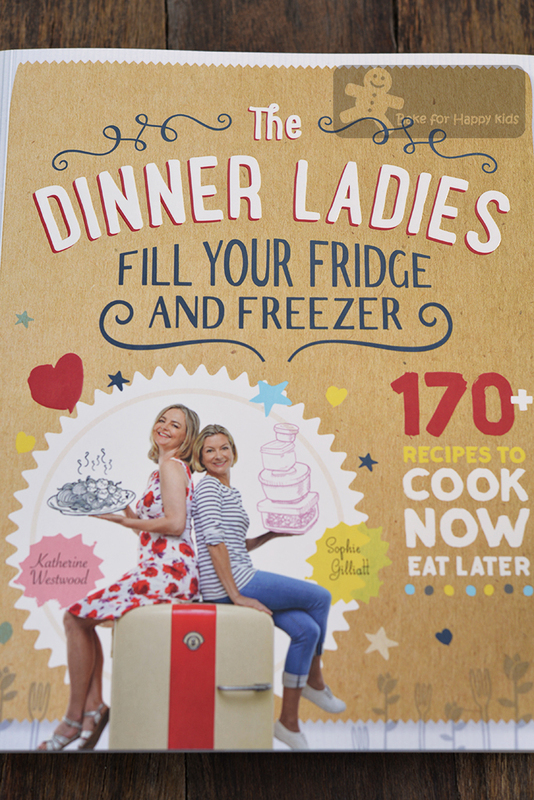 It is a cookbook full of family-friendly favourites. Don't you think that most mums and dads are like supermen and superwomen? After our long tiring working days, we still have a massive list of daily chores to do... like picking the kids from schools and childcares, laundry, cleaning the house, dishes and COOKING! Plus cooking delicious and nutritional food for little fussy eaters??? Gosh! 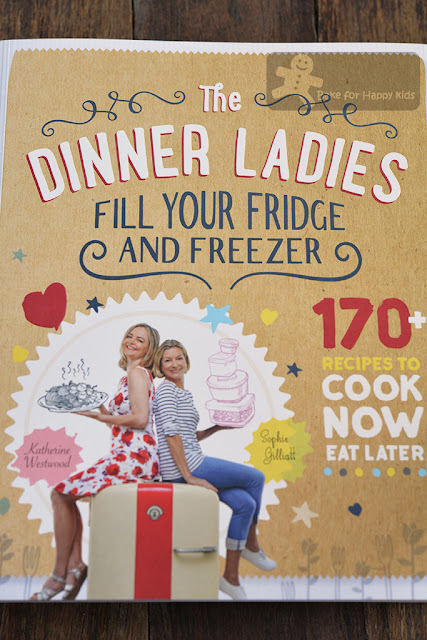 This is why the Dinner Ladies who are also mums of seven children, Sophie Gilliatt and Katherine Westwood came up with this book of fabulous recipes that can prepare delicious home-cooked food in advance and store them in the fridge or freezer so that we can serve dinner in a jiffy. There are many family-friendly favourites to choose from this very practical book and here are a few examples of the classic home-cooked food. I know because I cooked heaps of these homely foods too :) and I can definitely see that this book is very handy to use for my daily cooking. And I absolutely love it!!! If you think that you need this book right now, you may wish to know that this book is available now in most retail or online book shops selling at the retail price of AUD$39.99. Zoe.Thank you for sharing the healthy recipe. Next time try to slice thick slices of Sweet Potato not into rings but slice it lengthwise, then cut into strips then cube them, faster. Seeing this superfoods salad of yours ... I know I need some discipline.